The application has rolled out support for video calling within its messaging interface. It also received a few major updates including an all-new IGTV interface and platform for longer video uploads. Instagram is no longer just a picture sharing a social network. The application has rolled out support for video calling within its messaging interface. It also received a few major updates including an all-new IGTV interface and platform for longer video uploads. 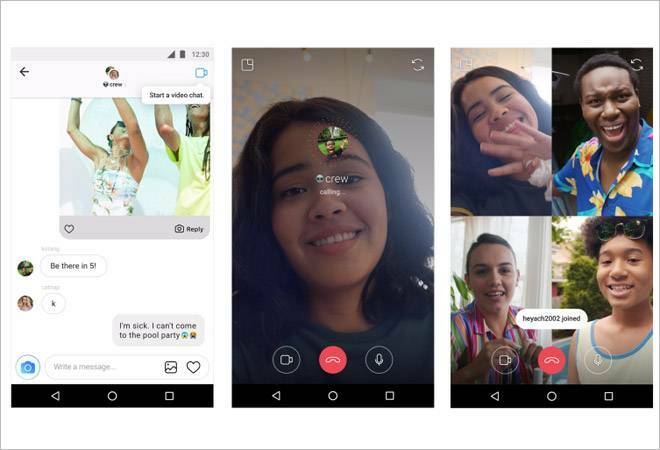 The new video calling feature on Instagram is available to all users. To access the feature, you'll have to update the app to the latest version. In order to make a video call, the user will have to head to the chat section and select a contact. In the chat section, you'll find a camera icon on the top right corner for video calling. Tap the new camera icon in the right corner, and the video chat will ring your friends' phones. Instagram will also allow multitasking while making a video call. You'll be able to minimize the video and continue using all of Instagram's functions including sending messages and photos in Direct, browsing your feed, posting a story and more. Video chat can also be used in groups with up to four people at a time. Within the group, once the video call is live, other participants can join in. The only difference is that the calling icon will be blue while the call is active. To leave the call, you'll just have to cut the call with the red phone icon at the bottom of the screen. Video chat can only be accessed with contacts that you have a Direct thread with. A blocked contact will not be able to call you. The app also gives you an option to mute contacts. By muting a contact you won't get notifications from them. To access the settings of the new feature you can tap on the gear icon on profile and find the new video chat control in Push Notifications. Instagram has also added a new feature within the Explore tab of the application. To get to the new feature simply tap on the lens icon at the bottom of Instagram's interface. On the explore page you'll notice a new tab on the top of the page marked with different categories. The first category will be curated just 'for you'. This tab will show content from profiles similar to the ones you follow and explore more often. The other tabs include options like fitness, art, humour, TV and movies, style, sports and many more. According to Instagram, the new explore option will let the user make more discoveries in a more targeted way. The official blog states, "Topic channels on Explore give you new ways to discover your interests on Instagram. Over 200 million people visit Explore every day to discover new ideas and find inspiration. Now it's even easier to browse through posts you want to see and accounts you want to follow." They further added, "With topic channels, you can be more intentional about how you navigate posts on Explore." You can also control what you see in the Explore tab. To stop a particular section from popping up, just tap and hold the tab; a mute option will pop up. You can also delve deeper into a particular section by selecting relevant hashtags. Instagram has also introduced new camera effects that are designed by Ariana Grande, Buzzfeed, Liza Koshy, Baby Ariel and NBA in the Instagram camera. New filters will be designed by popular accounts.